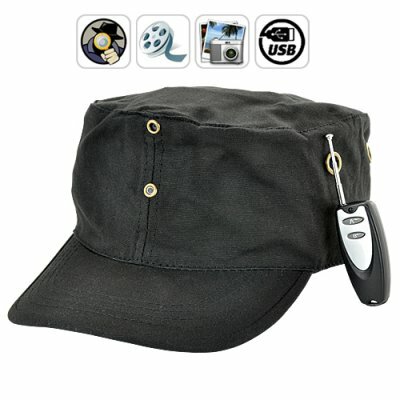 Successfully Added Hat With Remote - Hidden Pinhole Video Camera + DVR to your Shopping Cart. This hat lets you record high quality undercover videos wherever you go and without anybody knowing the better. That’s because the camera is actually hidden behind the hat and the extremely small pinhole lens is hidden within a rivet in the hat! So even if people are looking directly at the hat, they still won’t be able to notice the extremely hidden video lens! This hat comes with an impressive 4GB of memory so you will have enough storage capacity to capture hours of high quality undercover videos with audio. Video is recorded at 640x480 resolution and 30FPS which gives you nice and detailed videos. Using this device is quick and easy too. Just turn it ON and press the RECORD button on the remote to begin recording, press it once more to stop and save. The design of this hat is modern and stylish enough to wear with any casual style clothing and can be used just about anywhere you go. This device isn’t limited to use either. Use this camera to document your daily adventures or simply keep it on your head and capture all of life’s spontaneous moments. If you are looking for a virtually undetectable camera that you can use anywhere you go then you have found the right product. Place your single piece or bulk orders now while this brand new device is still in stock and ready for next day shipping. This hat comes with our 12 month guarantee and is brought to you by the leaders in high-tech gadgets, Chinavasion! 1 hour of video uses about 2GB of storage.